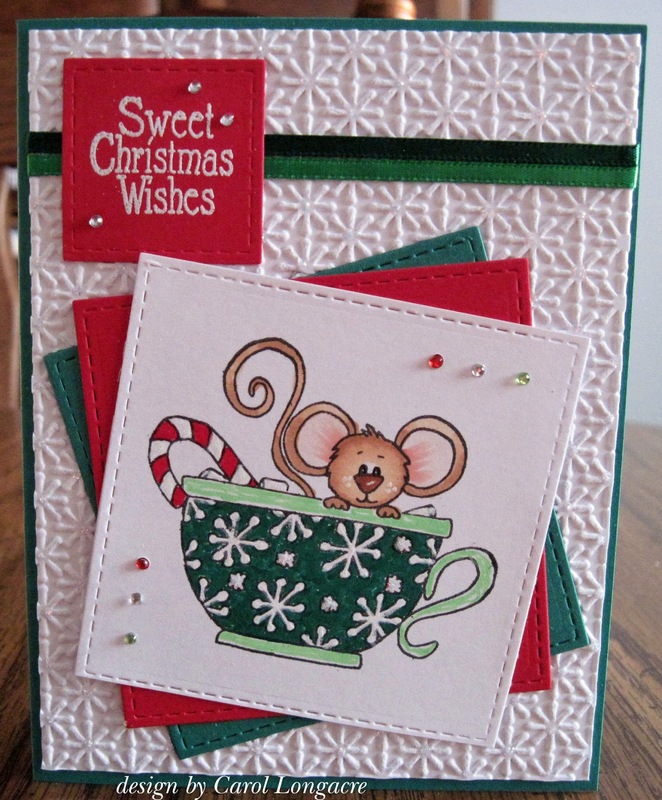 Here's another last minute card made for a child using a Sweet'n Sassy Cocoa Mouse stamp set and sentiment. I used Copics, a white gel pen, and a green glaze pen to color the image, adding dabs of Diamond stickles to the tiny snowflakes on the cup as well as to the centers of each embossed snowflake on the SU! Starburst embossed background. The camera doesn't pick up the glitter but click to enlarge the photo and you may be able to see it better. I die-cut 3 squares of red, green and white cardstock with GinaMarieDesigns stitched squares dies, and added red, green and clear gemstones to the image panel. I used 2 pieces of green ribbon from my stash, and heat-embossed the sentiment with white ep and called this one done! I'm going to share this with Craftyhazelnut's Christmas Challenge CHNC 364, where it's always an anything goes Christmas theme, and the option this week is to use glitter. Thanks for the little visit, and I hope you are wrapping things up for the big day too! There's always so much to do in the days just before Christmas! Whew! Really cute and great coloring! Keep warm!!! 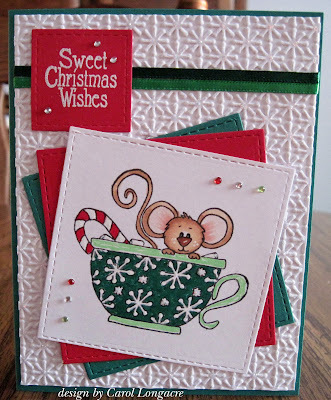 A super card Carol, such a fun image and lovely embossed background. Oh, I love this cutie! And, I love your coloring of that image too. That embossed background really looks great with it. You always color Cocoa Mouse perfectly. Guess that comes with lots of practice. Totally adorable! You've got some really expressive stamps in your stash. This is another one I love the look of this little peeping mouse! Great coloring, love the way you've done the festive mats, and of course the embossing looks just like falling snowflakes. The way you've added the ribbon borders at the top is a pretty design feature as well. TFS, Merry Christmas, and Hugs. Along with a big thank you for the fabulous Christmas calendar card you sent, love that, and the sweet little tag. This is absolutely adorable! Love that adorable Cocoa. Can you believe I have this set and have never made a card with it?!?! I have way to many of those!